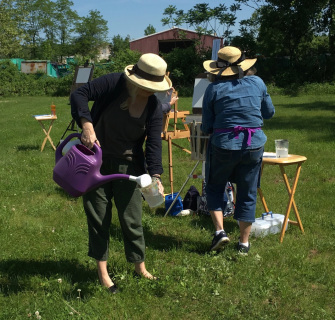 Welcome to the Exciting Adventures of Plein Air Painting! Exciting yet challenging but so rewarding! Painting outdoors is one of the most exciting and rewarding ways to work. However, it can be challenging and a little bit intimidating to leave the studio and learn how to decipher so much visual information! Learning foundational skills while on location. I will show you how to get started by walking you through my process for creating lively, vibrant paintings. The emphasis will be on developing a strong foundation of learning to see colors and mix them with a limited palette. Learning how to use certain artists' tools like a view finder, a sketchbook for small thumbnail sketches and even your smart phone for understanding value. How to simplify forms and editing to capture the essence of a location. Each session will start with a brief discussion about one of the key elements of painting - design, composition, value, color mixing, color temperatures, and edges. I will include a hand-out with helpful exercises to practice and additional references to take with you. I will first start with an abbreviated demonstration to focus on the lesson of the day. During the demo you'll be able to ask questions and take notes in your sketchbook. Next, it's your turn to paint. You can either set up your easel right behind mine and work on the same scene (this is an excellent format if you're brand new to painting) or you can choose your own location. Once you've selected your location, and get set up, I will go around to each student to assist one-on-one to help or make suggestions. You'll have approximate two hours to work on your own painting. Gather, Gentle Critique and Lunch. At the end we will gather together where we first started and side by side we'll review and encourage each other through a gentle critique that will help in the learning process and enjoy lunch together. Afterwards, you can stay and work more or your piece or pack up. I have selected 4 different locations these are just a few of my favorites. I tried to choose places where there are plenty of different scenes/subjects to paint, bathrooms (or portable toilets) and plenty of parking. Variety is all around us! ​We are so fortunate here in Connecticut to have so much variety in our quaint little state! From oceanscapes to beaches, farms and pastures, rolling hills and waterfalls. Historical gardens and New England charm. We have it all! (can you tell I love Connecticut for it's abundant visual vistas! ) Depending on where you live, it might take an hour to drive to the destination. Maybe you want to invite a friend to share the ride, that's always enjoyable. So far, I've set up 4 dates all Thursday mornings from 9-1pm from June to August. I'm an optimist so I'm hoping for great weather for each session. What if we have bad weather? And what do you mean by bad weather? It doesn't have to be full sunshine to paint outdoors. Overcast, fog, and slight drizzle are still ok to paint in. In fact, this is what makes plein air painting fun, exciting, and yes challenging! If the forecast states thunderstorms or heavy downpour then the class will be cancelled. By 7:00am I will notify everyone who is registered, via email or text, if class is on. If class is cancelled due to inclement weather, a new date will be selected. Each student will be responsible for their own supplies and easels. Students can work in either oils or acrylics. See the right hand column for supplies or download a printable copy. Beginners are welcome! We all start some where! We will have students at all different levels in each sessions, that's just how it goes and in fact I encourage it. The new students learn just as much from me as from all the other students. There maybe some vocabulary words that are new to you but that's ok, you'll catch on - we all start some where. If you are new to painting, I would suggest that you read a blog post that I wrote recently for my class. click here to read. Plein air painting is a passion of mine!... Teaching is too! 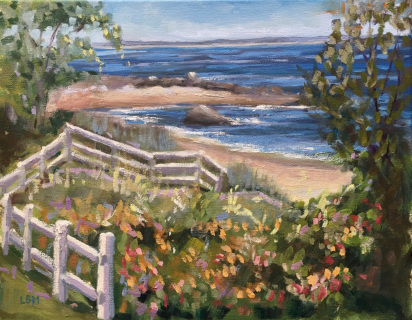 I just love sharing what I know and my experiences to help my artist friends, students and to connect with others who love the beauty that surrounds us. My goal is to introduce you to our beautiful state of Connecticut and see it through the eyes of an artist. 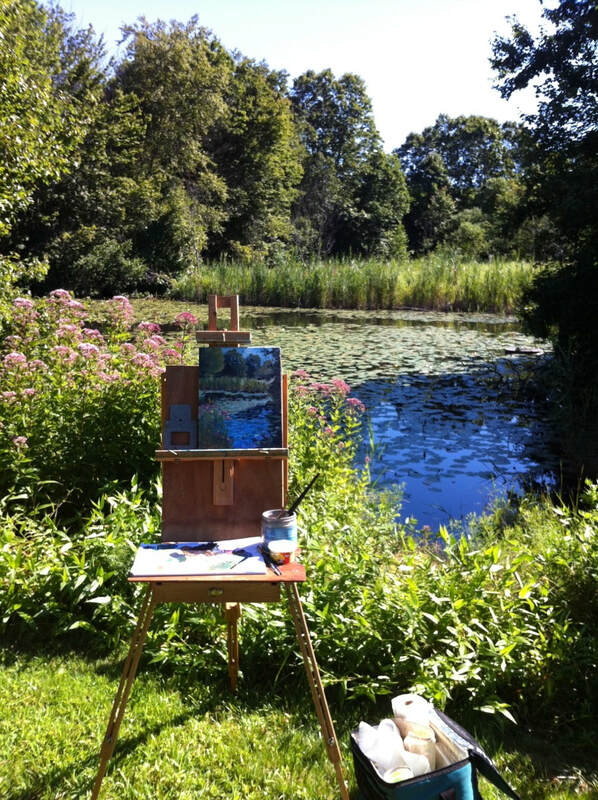 To fall in love with plein air painting and to help grow your artistic skills. To help you build your painting confidence, to encourage you to paint what you love and share it with others. Creating art and sharing your art has a way of connecting us with others, seeing beauty in the ordinary and developing long lasting friendships. I look forward to teaching you. Please feel free to contact me with questions or even suggestions on where to paint. I'm always looking for new places to discover. Would love to take the classes but can't make it on Thursday mornings? Send me a message and let me know you are interested. If I get enough requests for Saturday morning or Saturday afternoon I will open up a second class on Saturdays. What Does "En Plein Air" Mean? The French call painting outdoors "en plein air" - "in the open air" - some say plein -air others say plain- air. It doesn't really matter. According to art historians, there are many records of artists' sketches done outdoors dating before the impressionism era but these sketches were done for practice or recording. It was the Impressionists that considered a painting done "en plein air" as a finished work. Currently, the Plein Air Movement is one of the largest art movements in art history. As the Publisher of Plein Air Magazine says "It's the new Golf". Groups of artists are taking their easels and art supplies to venture outdoors to paint their surroundings. There are several groups in Connecticut to join. On a larger scale there are Competitions, Paint Outs, Quick Draws, Invitationals and Festivals held throughout North America for Plein Air Painting. There's even an annual week long convention where well over 1000 artists attend. That is definitely on my bucket list! in 2019 the convention will be held in San Fransisco! Linda's class are always great fun with new exciting learning experiences. ​Opened to the public in 1897, Elizabeth Park was born of the American Park Movement. Elizabeth Park is the botanical gem of the Hartford park system. It is 101 acres in size, with 82 acres in West Hartford and 19 acres in Hartford. Elizabeth Park is listed on the National Register of Historic Places. My photos don't come close to capturing its beauty. This was one of the first times I ventured off my home property to paint on location. I met up with the Connecticut Plein Air Painters Society in June 2012. I found a nice shady spot under a big tree. I've returned a few times since then to paint, sketch or take reference photos. • We would love to see your painting. Post on our Facebook page. click Add to Cart button next to description. Next click Checkout. Once basic registration information is complete, payment is processed through the secured PayPal website. There is an option to use debit or credit card instead of a PayPal account. I will do a demonstration first - and then each student can choose their location to set up to paint - I will go around to help each student individually. We will all gather around noon for lunch and a light critique. Each student will need to bring their own supplies. So if you have a conversation with me about plein air painting, within in a few minutes you'll know that one of my all time favorite places to paint is a shoreline conference and retreat center called Mercy by the Sea or The Mercy Center in Madison. Each time I drive up the narrow driveway and reach the crest of the hill, open my car door and smell the salt air... it's like filling my artistic well and nurturing my soul. Time seems to stand still here. There are days when we are to honor a silent retreat but for the most part everyone seems to drift into that quiet and reflective state naturally. What I love is the variety of seascapes and landscapes, well manicured gardens and rocky beach. There is something for everyone. And did I mention that there's a beautiful Art Gallery on both sides of reception desk. p.s. super clean bathrooms too! Meet in the parking lot near the main entrance. Everyone must signing to receive a guest pass. There are bathrooms near the front entrance AND..... a lovely ART Gallery on either side of the reception desk. Each student will need to bring their own supplies and lunch. If you want to be a plein air painter in Connecticut, plan on painting a few red barns. :) And what better place to paint them is at Brooksvale Park. It's a 500 acre hidden gem on the town line of Hamden and Cheshire off of rt 10. I live less than 10 minutes away so I've painted there several times. The property is well maintained. 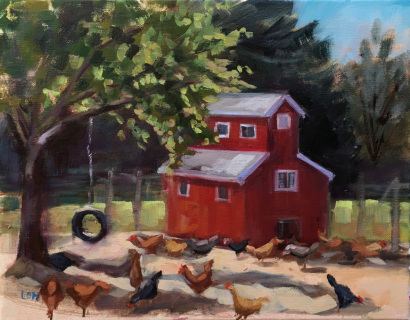 There are variety of different shaped barns, some easy, some more challenging to paint. The barn animals walk around fenced in areas. The summer camps are over by the 3rd so we probably can set up similar to the scene in the photo. This was taken in the late afternoon but we can definitely find plenty of shade. Meet in the parking lot near the main entrance. I have not been to the Hill-Stead Museum in a few years. But when Jan mentioned it in our last class I quickly remembered the grounds and the house tour.... yes! A fantastic place to paint. They welcome artists and photographers on the grounds. There are a few rules to follow but nothing that shouldn't stop us from having fun! You will find buildings, gardens, meadows, woodlands, fences, stone walls and views an inspiration for our plein air class. Three are tours of the house and highlights of the estate. They range from $12-16 and run for 55 minutes. The last tour is at 3pm. If you've never been here before, the Tour is definitely worth it! There are beautiful works of art inside and the stories the docents tell about the family is fascinating. Some local libraries offer museum passes to get in for Free - check your library. I don't have any paintings of the Hill-Stead Museum to show you but I'm hoping to get there at least once to paint before this class begins. How I got started. 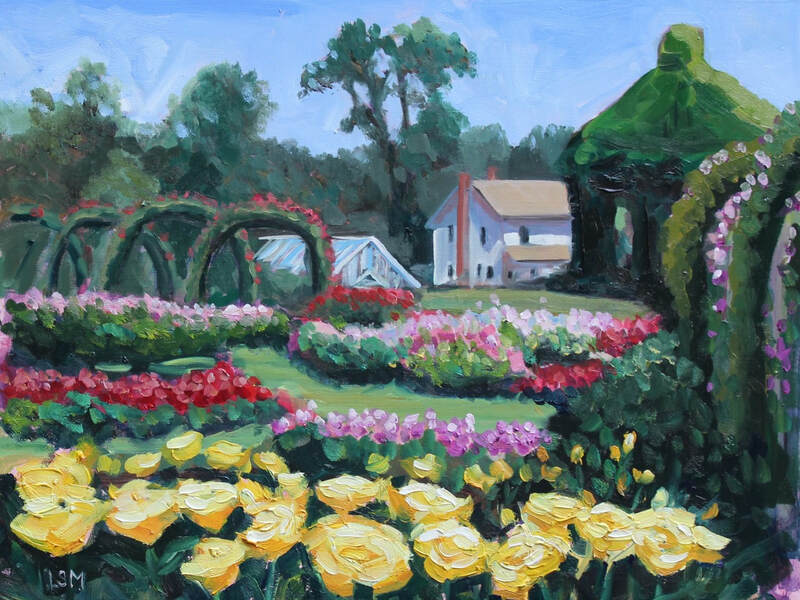 For me, I started painting outside in May of 2012, my first painting was of our garden. All winter long I was painting still lifes and small pieces in my studio but when the weather started getting warmer I felt the urge, the hunger to go outside to paint. I wrote about this day on my blog - here's the link to the post. By the way my first set up was with a portable metal easel and tv tray. I purchased a used Jullian French Easel a few weeks later on Craigs list. From that point on I was definitely hooked! Addicted you might say. I had no clue really how to do this plein air thing but I knew I loved it. I love the adventure. Meeting people, finding new locations and building my skills. But it was challenging for me to paint alone. The day would start off great and I would be full of energy and excitement to paint outdoors, but what would end up happening, I would drive around afraid to get out of my car or set up my easel. I wanted to find a place where I could feel safe and yet not right in the middle of things that I would have people watching me. In time and lots of practice, I've learned to be more confident painting outside even if someone is watching me. I would love to share all that I know about plein air painting ... so you fall in love with it too!